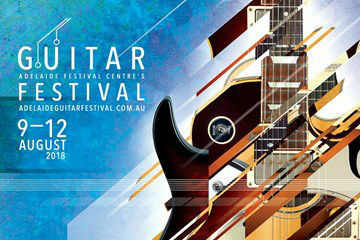 Festival Theatre, Adelaide Festival Centre, Sun 12 Aug. There is more to the Adelaide Guitar Festival than the performances over the weekend, specifically I refer to the Winter School (there are also gigs in hospitals and nursing homes – taking the music to some of those who’d otherwise not get to see any). 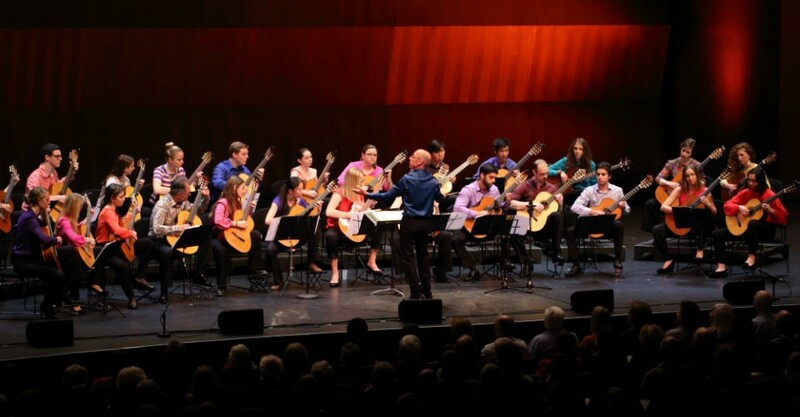 The culmination of the classical guitar part of the Winter School is to perform at the Festival Finale, indeed, to open the gig, which means a very eclectic audience that includes parents, siblings, grandparents and guitar aficionados – and therefore one might expect the musical offerings to reflect this. There is also another (non-musical) feature, the very talented Julia Zemiro as MC – adding a bit of sparkle, pizzazz and humour. Not having experienced a guitar ensemble before (Gypsy Kings doesn’t quite make the numbers! ), I was impressed with the big sound, the interesting and harmonious arrangements and how accomplished the students sounded; they did a great job and those of us who weren’t related had plenty to enjoy! A second, slightly smaller and more accomplished Elder Conservatorium Guitar Ensemble (mentored by Martha Masters with the help of the Helpmann Academy) played a Sebastian piece (with Sebastian in the audience) and a piece by one of the ensemble – it went down a treat! A band of Brothers and (almost) Sisters – the Brothers Grigoryan and the Beijing Guitar Duo with some very hot classical playing – are definitely something for the players in the earlier ensembles to aspire to. It was great to see female guitarists getting the nod on the big stage (each of the ensembles had female members, though they were in the minority – they were there!). The final performance for Act One was Chrystian Dozza playing solo classical guitar, as many traditionally do. Adding plenty of Brazilian flair to the pieces he played, Dozza showed that a performance can be more than what is written down on the page. A very casual Derek Gripper opened Act Two as part of his first Australian performances. Gripper is incredibly engaging, telling stories and jokes in between a guitar virtuoso. However, having yielded to some personal reflection, wondering what he was doing while touring in Europe, playing German music to German people in Germany (read Bach) he has changed his direction considerably. Now focusing on African music, we hear pieces transformed to guitar from listening to Toumani Diabete – the Kora virtuoso, a Salif Keita rearrangement as well as a number of his own compositions. For me, this was a highlight, African music being arranged and performed by classical guitar, while staying true to the African original – brilliant! The final act was Brisbane’s Aurora Guitar Ensemble who was such a delight to listen to and watch – the pure joy of playing being quite infectious (and very colourfully dressed)! Interviews by Julia Zemiro included our understated Adelaide Guitar Festival Director, Slava Grigoryan, and she couldn’t resist a chat with the effervescent Derek Gripper. But the man of the moment was the birthday boy himself – Dr Paul Svoboda, the director of Aurora Guitar Ensemble and conductor of the earlier ensembles. He clearly loves what he does, his positive energy and excitement certainly rubs off on students and audience alike and we all enjoyed singing him Happy Birthday!